Are you using all kinds of chemical exfoliants and peels on your face? I know, I was too. Spending a lot of money doing it too. My skin is sensitive so there's always redness and irritation involved, but not anymore. I found InstantPeel, it's natural and safe for all skin types. 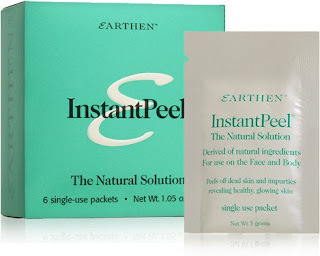 There's no irritation, no redness, I am really impressed! It's so easy to use. It works best in the shower. Steam your face for about 5 minutes to make sure your skin is moist and supple. Open one of the packets and apply just a small amount at a time to your face and neck and massage it in. No scrubbing or rubbing, just massage. It starts to work within seconds. I was so shocked at the amount of dead skin that was peeling and rolling of my face! Within just a few minutes my skin was shiny and new feeling! It's amazing to me how my skin feels! It's refreshed and smooth. This can be used once a month, so the box of 6 packets lasts an entire 6 months. That's a real value in compared to what you spend at the salon for a chemical peel. This is much safer for your skin too.